An angry Masood storms off to the Vic, while Zainab hears some home truths from Ayesha. Max tries to explain himself to Abi and Lauren, but they shun their father. Zainab reels from Masood’s destruction of the water feature but tries to cover, insisting they’ll have their family meal as planned. Ayesha snaps Zainab doesn’t know how lucky she is and confesses she loves Masood. Zainab’s amused at first but falters when Ayesha claims something could have happened; she knows Masood feels the same. In the Vic, a shell-shocked Masood confides in AJ that Ayesha’s crush made him consider his own relationship. AJ reassures him. Meanwhile, Ayesha swears that Masood will confirm everything and Zainab tells her to leave. Ayesha departs without saying goodbye to Masood; he spots her taxi leaving as he cautiously heads home .Masood finds Zainab calmly laying the table. When he lays a place for Ayesha, Zainab tells Masood that Ayesha’s gone and she knows everything. Max pursues a distraught Abi home, trying to explain. Abi won’t listen and is upset by his battered appearance. Lauren’s disgusted with Max for moving on to Kirsty so quickly after Tanya. Abi asks Max if he loves Kirsty; Max stays silent. The girls throw him out. Joey finds expensive earrings in Alice’s bag, assumes they’re from Michael and confronts him, insisting Alice won’t work for or sleep with him. Embarrassed, Alice pleads with Joey to leave, revealing she bought the earrings herself. 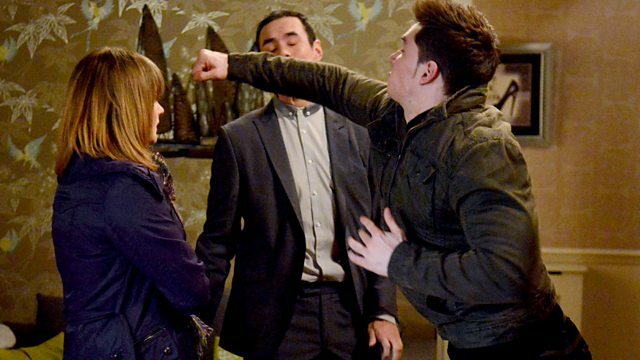 Michael pointedly tells Alice to make herself at home; Joey punches him and is hurt when Alice sides with Michael. Michael fires Alice. Denise promises to get Lucy to a doctor and support her, whatever the outcome. Bianca worries that Whitney’s repeating her mistakes by marrying too young, Tyler swears he’s in it for the long haul. Bianca remains unconvinced. Whitney’s upset – she thought Bianca would want her to be happy. Tyler presents Whitney with her engagement ring.